This is an example of a "modern" tune and arrangement. Picture: Silent Night' Chapel, Oberndorf, Austria (courtesy of the Oberndorf Silent Night Museum). Also see Bronner's Silent Night Chapel Page. It is likely the most popular Christmas carol in the world, but for many years, the history of the carol was a source of great confusion. An old manuscript has reportedly been discovered that shows Rev. Mohr wrote the lyrics in 1816, and that Franz Gruber wrote the score two years later at Rev. Mohr's request (the manuscript is now located at the Salzburg Museum, Carolino Augusteum; unfortunately, the English version has disappeared). Mohr never said what his inspiration was. Gruber did not disclose why Mohr made the request to add music to the poem (and you can safely disregard as purest fiction any stories about Mohr walking through the forest on a snowy night, or that invent any dialogue between the two men). Along with other students I was often the guest of the extremely sociable Rev. Joseph Mohr in Wagrain. In good humour we would drink a toast to the lyricist of 'Silent Night'. He would be grateful and say that it was one of the most treasured moments of his life, when shortly before Christmas, 1818, he met Mr. Franz Gruber and said: 'Let's work up something together for Christmas eve', which was the way it turned out; 'I did the lyrics and Franz Gruber, the melody' - the same Vicar Mohr always put it in those words. Whatever the underlying reason for Mohr's request to Gruber, this is arguably the most popular of all Christmas carols, and a favorite worldwide for over 190 years. Mohr was born into poverty in Salzburg on December 11, 1792, the illegitimate son of Anna Schoiberin, a knitter, and Joseph (Franz) Mohr of Mariapfarr, a deserter from the Salzburg army. His father abandoned Anna and the child, and later young Josef was taken under the tutelage of Vicar Johann Nepomuk Hiernle, a Benedictine monk and the Salzburg cathedral choir director, who recognized his musical talents. A chorister in the Salzburg Cathedral, Josef later attended Kremsmunster Lyceum, where he was an avid music student. In 1811, he entered the Salzburg seminary, and was ordained a priest on August 21, 1815. His first postings were to Ramsau and then to Mariapfarr in the Lungau region of the Salzburg province. It was there, it is believed, that he wrote the six-verse poem, "Stille Nacht! Heilige Nacht!" in 1816. The source of his inspiration is unknown (again, you may safely disregard any speculation); Mariapfarr was home to his grandfather, and this area had suffered greatly during the Napoleonic wars, which had just ended. Due to poor health, he was sent to Salzburg for hospitalization in the summer of 1817. In October, during his convalescence, he was assigned to assist the pastor at St. Nicholas Church in Oberndorf — where he met Franz Xaver Gruber. Oberndorf is located approximately 11 miles north-northwest from Salzburg. Also born into poverty at Unterweizberg, near Hochburg, Austria, on November 25, 1787, Gruber likewise showed his musical talents early. His father Joseph, a linen weaver, discouraged his study of music so he studied the violin secretly and in 1805-06, he took music lessons from Georg Hartdobler, the organist of the city parish of Burghausen. He was the schoolteacher at Arnsdorf from 1807-1829. During that time he was also the organist at Oberndorf where he wrote this melody. Later he became the headmaster at Berndorf, and for the 28 years prior to his death, he held the position of organist and choir director of the city parish of Hallein, near Salzburg. On December 24th in the year 1818 the curate of the newly erected parish-church St. Nicola of Oberndorf, Mr. Joseph Mohr handed over a poem to the deputy organist, Franz Gruber (at that time also teacher at Arnsdorf) with the request to compose a suitable melody for two solo voices with choir and the accompaniment of one guitar. Gruber did so, and the carol was first performed at the midnight mass on Christmas Eve, 1818. Mohr sang the tenor part, Gruber sang the bass, and the church choir did the refrains of each verse, which consisted of the last two lines of the verse. Mohr played the guitar accompaniment. It was said to have been enthusiastically received by by the congregation. In October 1819, Fr. Mohr was transferred from Oberndorf to Kuchl and somewhere between that time and 1821 he wrote out an arrangement of the carol (and see left). This document was discovered in 1995 and, after it was authenticated by handwriting experts and historians, has been proclaimed the earliest known manuscript of "Stille Nacht." Carl (or Karl) Mauracher, who made his home in the Ziller Valley, repaired the damaged organ in Arnsdorf — where Gruber lived — in 1821 and installed a new organ in the church of St. Nikolaus in Oberndorf in 1825. Not later than 1821 visit — but probably as early as 1819 — he had with him the words and melody for "Stille Nacht!" (one of the earliest known copies was dated 1822 and owned by Johann Baptist Weindl, singer and director of the parish choir of the Salzburg Cathedral). It isn't known how Mauracher came to have this copy; again, you should ignore any hypothetical fantasies). For more information about this man, see the Karl Mauracher Gallery (link opens in a new window at an exterior site). Mauracher shared this song with two neighboring families of singers in the Ziller Valley, the Strassers and the Rainers. Both families embraced the song and sang it throughout Europe. Stille Nacht Gesellschaft also states that at Christmas, 1819, the original Rainer Family Singers sang the song in the parish church of Fügen (Zillertal) and again three years later at the Castle of Count Dönhoff . It was during this period that the original melody was slightly changed. 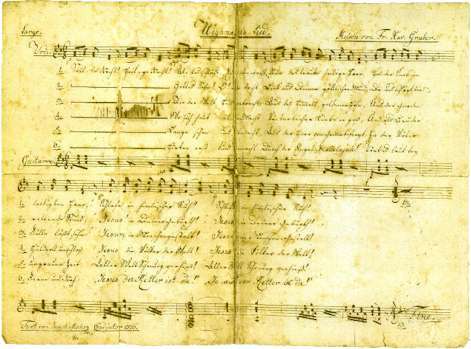 Stille Nacht Gesellschaft reports the song was included in a church songbook dated July 22, 1819 and prepared by Blasius Wimmer, organist and teacher in Waidring (Tirol). Unfortunately, this can't be verified as this copy is now lost. The first verifiable publication of the song occurred in 1833 when publisher A. R. Friese of Dresden and Leipzig included it as the fourth song in a sheet music booklet entitled "Vier echte Tyroler Lieder..." ("Four genuine Tirolian songs..."). In 1838, "Stille Nacht" was also published in a collection called Leipziger Gesangbuch (the full name of the publication: Katholisches Gesäng-und Gebetbuch für den öffentlichen und häuslichen Gottesdienst zunächst zum Gebrauche der katholischen Gemeinden im Königreiche Sachsen). The Rainers brought the song to the United States in 1839 where it was performed at numerous locations, including the Alexander Hamilton monument in New York, near Trinity Church. At that time, only a very few knew of the authorship of the carol which was already well known. Fr. Mohr served in various parish assignments after he completed his service at Oberndorf in October, 1819. In 1838, he was appointed pastor of the parish at Wagrain where he served for ten years. When he died on December 4, 1848 from a lung ailment at Wagrain, the authorship of the carol was virtually unknown. Those who knew him described him as generous and magnanimous, possessing a cheerful and happy disposition, coupled with deep religious beliefs and childlike piety. In 1854, at the request of the Royal Prussian Court Chapel in Berlin, the monastery of St. Peter's in Salzburg launched an investigation into the origins of "Stille Nacht!". It was on Dec. 30, 1854 that Franz Gruber wrote his authentication (and see excerpt above) which provided the world with the needed proof of composition of both the lyrics and melody. Word would spread slowly, however. It wasn't until July, 1877 that The Musical World and The Musical Standard would report that Herr Ludwig Erk had discovered the true origin of Stille Nacht. The subsequent discovery in 1995 of the Mohr manuscript (circa 1820, see above) confirmed the date of composition of both the lyrics by Mohr, and the melody by Gruber. Gruber died June 7, 1863. He was described as a respectable, conscientious and responsible man, a good musician, an excellent organist, and a creative composer. Additional biographical information about both Mohr and Gruber can be found at the excellent Stille Nacht Gesellschaft site: Mohr's biography and Gruber's biography. The old town of Oberndorf was relocated due to constant danger of flooding from the Salzach river. A new church was built in 1904; the original St. Nicholas church was closed in 1903 and demolished in 1906. A memorial chapel dedicated to Mohr and Gruber was erected on the original location of the church; it was blessed in 1937 and is the site of annual remembrances of the now famous pair. "Stille Nacht" has been translated into over 300 languages and dialects. Many versions in many languages can be found at Jako Olivier's Silent Night Web site, which I recommend. A good number of translations can also be found in Alois Schmaus and Lenz Kriss-Rettenbeck, Silent Night, Holy Night: History and Circulation Of A Carol (Innsbruck-Munich: University Press, 1968). A side-by-side German and literal English translation can be seen at Stille Nacht Gesellschaft (and also reproduced here in Silent Night - Free Translation). Additional English translations (among the over 300) can be found at silentnight.web.za. Also see: Christmas-tide Poetry by Emily Elizabeth Steele Elliott. The definitive English translation by Rev. John Freeman Young (1820-1885) was published in 1859, a 16-page pamphlet titled Carols for Christmas Tide (New York: Daniel Dana, Jr.). 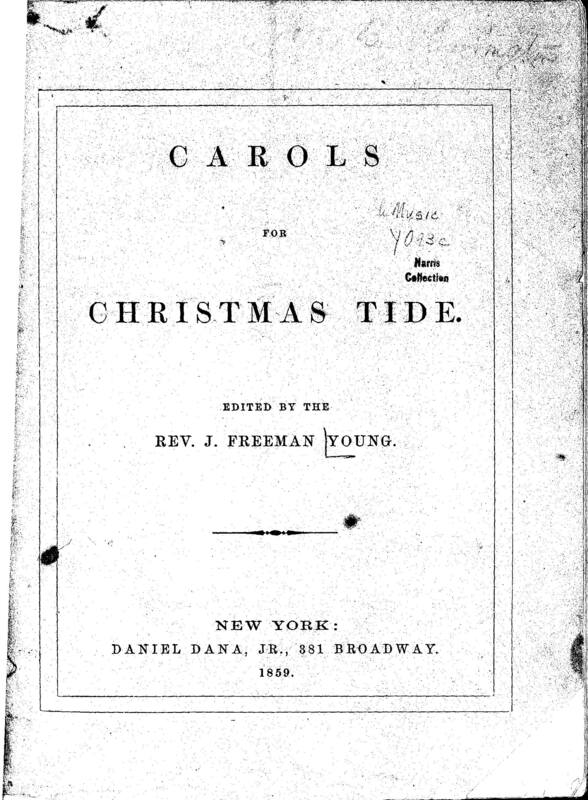 The first of the seven carols in this pamphlet was "Silent Night, Holy Night. "4 It isn't known when Rev. Young first heard the original hymn. Previously, most sources believed that first publication Bishop Young's version occurred in 1863 (which was also the year of the death of Franz Gruber) in The Sunday-School Service and Tune Book: Selected and arranged by John Clark Hollister5 (New York: E. P. Dutton and Company, 1863; hymn #15, page 34). Below the title, a single line of text gave the only attribution: "From the Third (unpublished) Part of 'Hymns and Music for the Young.' By permission of the Author. "6 Rev. Young was not identified as the translator; Part First of this series was published in 1860. Young's authorship of this translation was clearly established in J. H. Hopkins's 1887 publication Great Hymns of the Church Compiled By The Late Right Reverend John Freeman Young (New York: James Pott & Company, 1887). On page 81, Hymn 50, Young's name was identified as author of the translation. This would be the last association of Young's name with this translation until Rev. Byron Edward Underwood's 1957 article. For many years, the graves of Bishop Young and his wife were very sadly neglected. Silent Night Historian Bill Egan led the campaign to get those graves repaired which was finally successful in 2008. A popular adaptation of the Campbell translation was created by Alfred Bell (1832-1895), Holy Night, Peaceful Night. It was set to music and published by Joseph Barnby in his “Original Tunes to Popular Hymns,” Vol. 1 (London, 1869). Numerous other translations (and frequent adaptations) are found in hymnals and carol collections, frequently anonymously. A complete listing of the translations that I've found is below. On May 17, 2007, William C. (Bill) Egan posted his translation of the three verses not translated by Bishop Young (i.e., verses 3, 4, and 5). This translation was made at the request of Austria's Silent Night Society. The translation, and a recording (using Gruber's original tune), can be found at the Christmas International Group at Yahoo.com. His posting was message #6320 under the title “Silent Night - The Other Three Verses”. Sleep in heavenly peace — sleep in heavenly peace! There were no other verses appear. It was translated from the German “by a Member of the same Society” [i.e., the Society of Jesus – the Jesuits] and included sheet music with the title "The Angel's Last Song." "The Three Holy Kings," Third Revised Edition was published in St. Louis, Mo. by B. Herder, p. 100. The carol "Stille Nacht" was among the first heard during the historic and unprecedented Christmas Truce of 1914, which inspired a poem by Frederick Niven, A Carol from Flanders. Concerning the Truce of 1914, see: Stop The War And Love Thy Enemy (this article was also posted at Yahoo's Christmas International Group as Stille Nacht Stops The War - 1914). The Oxford Book of Carols (1928) did not contain "Silent Night, Holy Night." It has been said that the editors considered it "vulgar," according to The New Oxford Book of Carols (1992) where this omission was corrected. It was also excluded from Bramley & Stainer, Hymns Ancient and Modern, and most other English and American hymnals and carol collections prior to the early 1900s. 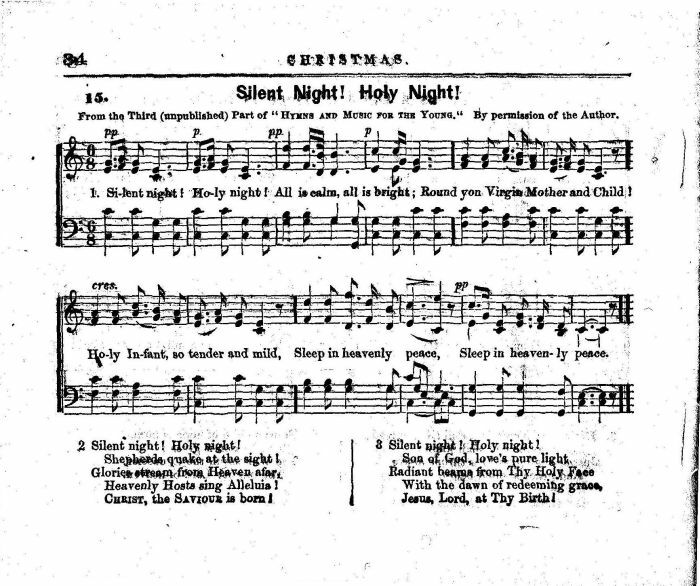 However, between 1900 and 1920, "Silent Night" was included in the hymnals of all the major denominations, together with many Christmas plays and Sunday School books. Popular magazines were no exception. 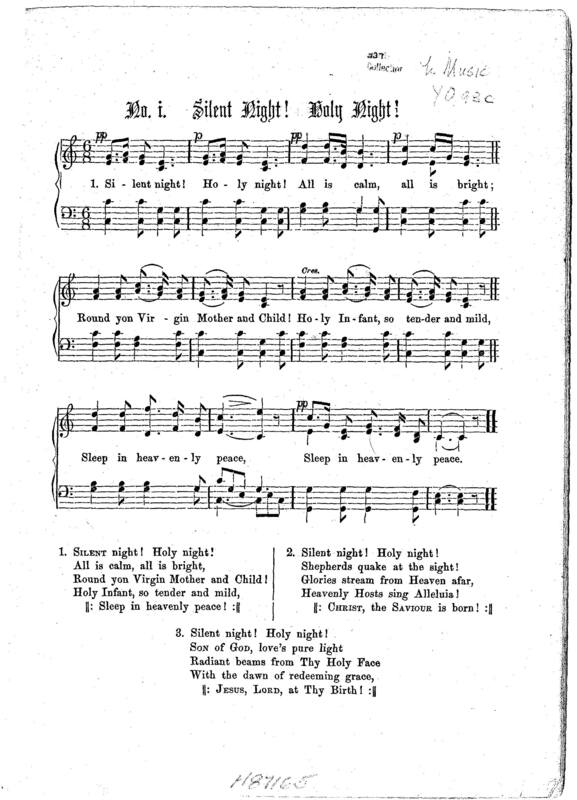 The Reader's Guide to Periodical Literature reported that "Silent Night, Holy Night" was reprinted in the Ladies' Home Journal on January 18, 1916 (p. 33). Indeed, by 1922, one crabby reviewer for The Musical Times and Singing-class Circular was discussing the selection of songs by a popular singer. He wrote, “Personally, I would rather hear [Marguerite] d'Alvarez in almost anything rather than the well-worn Silent Night, Holy Night, but de gustibus &c, and here she is making the most of Gruber's old song on a 12-in d.-s. With orchestral accompaniment." How interesting — and odd? — that this reviewer would find “Silent Night, Holy Night” to be “well-worn” in 1922. And how fortunate for the listening public that Ms. d'Alvarez "made the most of Gruber's old song." (plus non-English, humor, and translations still under copyright). Ten "new-to-me" translations have been added in the last eight days. Numerous volumes are being added to Google Books and the Internet Archive on a daily basis, accounting for many these new translations. 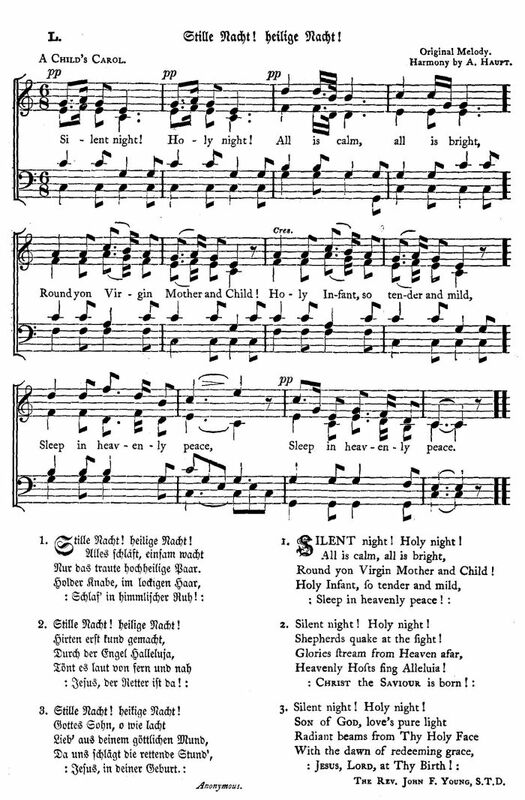 Stilly Night, Holy Night (Translation by Emily E. S. Elliott, 1858). Concerning Latin Translations of Silent Night. There are seven translations into Latin of the carol "Silent Night, Holy Night" on the page "Silens Nox" at a terrific blog by Dr. Laura Gibbs, "Bestiaria Latina: Gaudium Mundo." Dr. Gibbs is an online instructor at the University of Oklahoma, and she keeps a blog of Latin fables and proverbs at the Bestiaria Latina blog. She also maintains a Latin Carols page. By the way, if you would like to brush up on your Biblical Greek, see Dr. Gibbs' Biblical Greek Online Course. I only wish that she offered an Online Latin Course (since my attempts on my own seem to be nonproductive). "Silent Night, holy night;" old German carol, poem translated by Basil Douglas, arrangement by Leslie Woodgate. London: Ascherberg, Hopwood & Crew, Ltd. Nov. 8, 1938. "Silent Night, Holy Night" (Free Translation by Huge Keyte and Andrew Parrott, The New Oxford Book of Carols, 1992). The editors also include two musical settings: the first is a reconstruction from two of Gruber's originals (for two voices, organ and guitar, and choir repeating the last two lines of the verse); the second setting is a "modern" arrangement by the editors. "Silent Night, Holy Night" (Joyous Christmas! Holy Christmas!, English Translation of Glade jul, hellige jul! from Mike and Else's Norwegian Songbook (Bloomington, MN: Skandisk, 1985). "Silent Night, Holy Night." R D Manning, Wandering Jew Card Game (Salt-of-the-Earth, 1986), page 1.3. Contains some of J. F. Young's verses, plus new verses. "Silent Night, Holy Night" (Translation by David Willcocks, copyright circa 1970). Many of these translations can be seen on the Silent Night - English Translations page at Jako Oliver's Silent Night Web. Translations to many languages can also be found at this site. In addition, over 250 translations of Stille Nacht can also be found at the web site of The Work of God's Children. Holy Night, Calmly Bright (Translation by Mary D. Moultrie). Once thought to be a translation of Stille Nacht, upon later examination it was found to be a translation of another poem, "Watch we where in slumber light," by Johann Ludwig Uhland (1787-1862). On Jeanne Pasero's former site, Christmas in Wales, there was a Welsh version of Silent Night: Tawel nos dros y byd (plus two other Welsh favorites). Sadly, this terrific site has now disappeared. If it pops back up, please drop me a line. Thanks! The Silent Night Museum at Oberndorf contains an autographed manuscript which is the earliest version of "Silent Night!" known to date. It reveals information about the authors of the carol which was not known until the manuscript's discovery in 1995. There is also an on-line museum. Stille Nacht Gesellschaft contains information about the Silent Night Association, as well as a history of the song, the authentic text and sheet music, biographies of both Mohr and Gruber, and links to other Silent Night sites. Silent Night Web contains much interesting material concerning the carol, and over 200 translations. Ronald M. Clancy, Sacred Christmas Music (New York: Sterling Publishing Co., 2008). Beautifully illustrated, Mr. Clancy carefully distinguishes between known facts and well-known legends concerning the background of this carol. Ace Collins, Stories Behind The Best-Loved Songs of Christmas (Grand Rapids, MI: Zondervan, 2001). While I enjoyed this book, I cannot recommend the history of Silent Night contained in this volume. It is largely a fictional account. William C. Egan, "The History of Carols"
William C. Egan, A Christmas Treasure as well as several articles concerning the neglect of the graves of Bishop and Mrs. Young (that resulted in their 2008 repair). William C. Egan, "The History of Carols." Mr. Egan is a Silent Night Historian who was awarded a gold medal by the government of Austria for his work on this carol. He is the curator of the Christmas International Group and Silent Night Group at Yahoo.com. William C. Egan, Silent Night: The Song Heard 'Round The World; it can be found at Jako Oliver's Silent Night Homepage. William C. Egan, The Silent Night Museum, a cyber-museum was created by Mr. Egan to provide a world wide audience with the true story behind the composition of "Silent Night" and learn about its creators, Joseph Mohr and Franz Gruber. Josef Gassner, “Franz Xaver Gruber's manuscripts of Silent Night, Holy Night, with a short history of the carol,” from Alois Schmaus and Lenz Kriss-Rettenbeck, Silent Night, Holy Night: History and Circulation Of A Carol (Innsbruck-Munich: University Press, 1968). This article contains some excellent biographical notes concerning Mohr and Gruber, as well as an extensive analysis of the seven known manuscripts of the carol created by Gruber. The book also contains numerous translations of Stille Nacht. This is an excellent resource, if you can obtain a copy. "Version VII," above, is from this source. John Julian, Dictionary of Hymnology. Second Edition, 1907. Keyte and Parrott, eds., The New Oxford Book of Carols (Oxford: Oxford University Press, 1992), citing Dr. Joseph [Josef] Gassner, Silent Night, Holy Night: History and circulation of a carol, 1968, for having disposed of many myths concerning the carol. Robert Guy McCutchan, Our Hymnody. Second Edition. (Abingdon Press: Nashville, TN, 1937), p. 523. Edgar Legare Pennington, "Soldier and Servant: John Freeman Young, Second Bishop of Florida," (Hartford, Conn.: Church Missions Publishing Co., 1939). This detailed, 63-page biography emphasizes his service as Bishop of Florida, 1867-1885, but makes little mention of his musical endeavors, and no mention of Silent Night. There was, unfortunately, no photograph or drawing of Bishop Young. The majority footnotes were to Diocese of Florida Convention Journals. No other published biography was mentioned. No other biography is listed in WorldCat.